For a second there, the juxtaposition of my ragged, fourteen-foot UHaul barrelling up the well-coiffed upper reaches of Park Avenue was kind of awesome. Traffic was light. The gas pedal was heavy. Midtown was in the rear-view. And there was funk on the radio. What’s more, my heart was full of freshly-minted confidence. Overnight, I’d transformed our box-strewn, bare-windowed second bedroom into something pretty closely resembling a nursery. 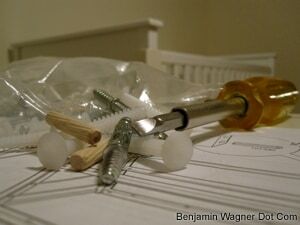 In some six hours of construction, I’d assembled a crib and dresser, hung a pair of blinds, and unpacked (“stuffing,” my wife calls it) dozens of rogue, homeless boxes. The dresser was an especially immense undertaking. Ikea’s Hemnes comes with 162 nails, screws and pegs; 20 individual pieces of wood, and a 16-page, 52-step instruction booklet to explain it all. I lost track in the wee hours in the morning, but there must have been at least 400 distinct steps to the process of building that dresser. But I pulled it off, with minutes to spare before Abbi’s baby shower. The nursery called on all sorts of skills either long-dormant or non-present. I understand why boys are encouraged to build model airplanes; it helps us learn to follow directions. Likewise comics; symbolic interpretation. Both of which sets a guy up to understand Ikea’s Bible-length assembly instructions. Complicated stuff. Not half as complicated, though, as driving a 1/18″ titanium drillbit though an aluminum-reinforced sheetrock window frame. Ends up finesse doesn’t always outdo force; sometimes, you need a drill. I turned the last screw just as Abbi’s sisters pulled up in the UHaul, apparent to me the the bellowing horns of impatient Long Islanders endeavoring to squeeze by her on what might be the narrowest street in all of New York. I dashed downstairs, rushed my air-kiss greetings, and threw open the back. My new brother-in-law, Pedro, and I quickly moved two chairs, two rugs, and a sleeper sofa (that insisted on opening itself like a suicidal Jack-in-the-box) upstairs. I raced out the door, heart-beating, hands-unsteady, and mounted the great, white whale. I’ve never driven a truck. And I rarely drive in the city. Years prior, I would have passed the buck, shirked my responsibility. I’ve been stealing myself for these sorts of situations, though, moments where previous experience prove insufficient, where blind faith, dumb luck and a straight face carry the day. It was simple: I had to do it. Which may have had something to do with my levity there soaring along on Park Avenue. Once my funk-on-the-radio moment past, though, I found myself at 104th & Lexington with nary an orange-striped white van in sight. I circled the block once, then again, then double parked in front of a church, turned on my blinkers, and dialed UHaul. A kindly, old gentlemen who was surely answering from somewhere deep in South Dakota greeted me. “Are you anywhere near Bushwick Avenue,” he asked. Less than a block after dropping the UHaul, my brother called. By the time I got back to the apartment, it was filled with young mothers chirping in a high-pitched, dolphin-like tone. There were sundresses and cupcakes and many, many onesies. I kissed my wife, and ran for the door. Moments later, my pal Chris picked me up. “You’ll never believe my morning,” I said, regaling him in my morning of newfound daddy duties. Another great post, welcome to parenthood! We recently finished a swing set for the kids…15+ hours spread out over a couple of days! Cheers!